happy new (islamic) year! the other day as I was musing about time - yes a preoccupation of late. I was thinking of when and how various cultures and traditions mark time and signify endings and beginnings. many cultural traditions use the moon to mark the passing of a year. the islamic calendar is one which is based on lunar months. 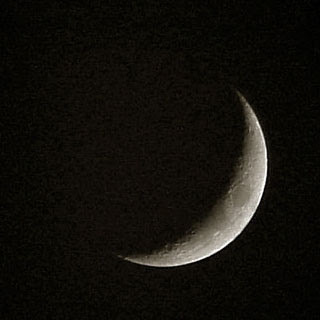 today is muharram - the new year - which begins with the waxing crescent moon. using this calendar 2008 is 1429. muharram is celebrated with reflection, prayer and sometimes fasting. the title of this post comes from a song on joni's herija album. the album's name is a transliteration of hijra, which refers to the journey the prophet muhammad's and his followers went on as they fled to medina in 622.
happy new year, happy journey. as we journey may each of us find kindness and comforting refuge in the arms of others - be they friends or strangers (for what is a stranger but a friend one has yet to meet - who said this?). What a beautiful song. Wow! The phases of the moon are as good a way to mark time as any other. Counting gray hairs is unreliable, but it doesn't stop me from worrying about getting them prematurely. it took me a while to work out they were on ice. haha. He must have been cold lying there at the beginning. its funny, how the New year thing is so random in some ways - but feels right in others, measuring time, reflecting, looking forward etc. i know this song, but i think from another album? i must revisit. Hiya - Happy New year to you, albeit belatedly. Thanks for your comment. Hope you have been well. M.